Jewish Cookery Book by Esther Levy, published in Philadelphia in 1871, is currently thought to be the first Jewish cookbook published in the United States. Its full title: Jewish Cookery Book, on Principles of Economy, Adapted for Jewish Housekeepers, with the Addition of Many Useful Medicinal Recipes, and Other Valuable Information, Relative to Housekeeping and Domestic Management, accurately describes the book’s impressive and ambitious scope. 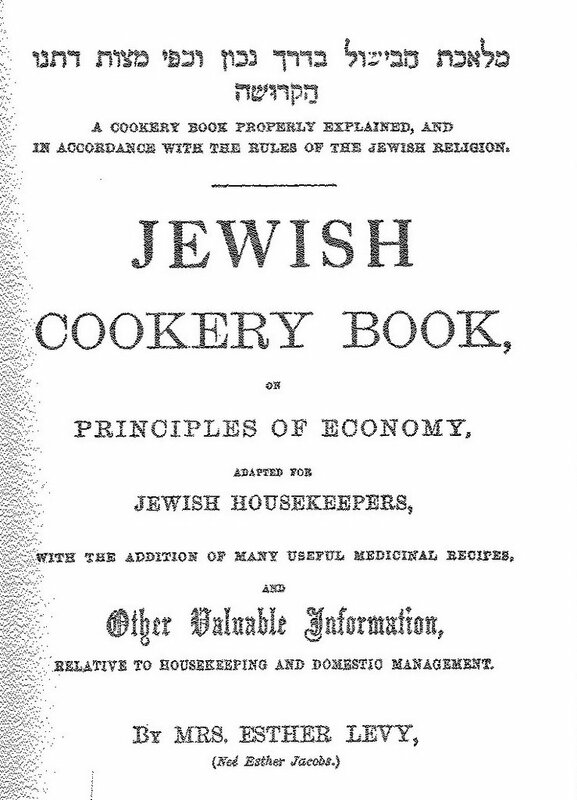 The Jewish Cookery Book includes recipes drawn from English cookery (Toad in a hole, Bubble and squeak, steamed suet puddings), American cookery (Corn bread, Succotash), and Ashkenazic (Central European) Jewish cooking (Matzo fritters, Luxion pudding), as well as recipes that are a fusion of all three, such as “Coogle, or pudding, and peas and beans.” In addition to recipes, the author provides an extensive section on “Medicinal recipes,” household hints for cleaning various materials and exterminating diverse pests, suggested weekly menus and two views of the year: A guide to seasonal produce available for each month and a guide to the Jewish calendar. I would recommend a pretty bouquet of flowers in the middle of the table; their fragrance refreshes the eye and gratifies the mind, as there is so much sweet language embodied in flowers. Take a shin bone and a piece of bola, about three pounds; get a pint of Spanish beans, others will serve the same, and a pint of Spanish peas; put them in a brown pan, one that will fit in the oven, and put the beef, peas and beans in it, and cover it over with water; add pepper, ginger, salt, and a little cayenne pepper. Make the coogle in the following manner: a quarter of a pound of currants, a quarter of a pound of raisins, a quarter of a pound of sugar, the same quantity of bread crumbs and suet, chopped fine, four eggs, a quarter pound of flour, some spices and a small piece of citron. Mix well together; put the coogle (or pudding) in a basin, place it in the pan with the peas and beans, and cover the basin with a plate. Let it cook a day and a night, and dish up the soup without the meat. Some persons like the meat, others do not. Turn out the pudding and eat with a sauce. Be sure while cooking this dish, to see there is sufficient water on it; if plenty is put on at first, it will not require much when cooking. Coogle. Kugl. Esther Levy is writing at a time when words of Yiddish and Hebrew extraction have not yet begun to appear commonly in Romanized form in written English. Other interesting spellings chosen by Levy are “luxion” (lokshn) for noodles, and “cowledge” (koyletsh) for braided Sabbath bread (challah), literally “coil.” Levy translates this as “twist.” Levy also uses the word “cowledge” for a wedding cake. And peas and beans. This is in fact a recipe for tsholnt with kugl, a traditional Sabbath combination. The tsholnt itself is here presented as secondary. The recipe appears in the poultry section of the cookbook, although there is no poultry in the recipe, perhaps because tsholnt with kugl, like poultry, is associated with the Sabbath. Bola. In Jewish cookery, “bola,” from the Spanish word for “ball,” has two meanings. Here it refers to top sirloin, a cut of beef that is round in shape. The Jewish Manual uses the word “bola” to mean a sweet, baked pudding. See Judith Cohen Montefiore and Chaim Raphael, The Jewish Manual, or, Practical Information in Jewish & Modern Cookery: With a Collection of Valuable Recipes & Hints Relating to the Toilette (New York: NightinGale Books, 1983), 61 and 65. Spanish beans. White beans. In English cookery, three types of beans are commonly called “Spanish beans”: White beans, favas, and tolosa beans, similar to red kidney beans. The nature of this recipe indicates that white beans are used. Others will serve the same. Other types of beans may be substituted. Brown pan. A glazed earthenware vessel. Cayenne pepper . Spiciness and a fondness for intense flavors are characteristic of Anglo-Jewish cooking; see Barbara Kirshenblatt-Gimblett, "The Kosher Gourmet in the Nineteenth-Century Kitchen: Three Jewish Cookbooks in Historical Perspective," The Journal of Gastronomy 2, no. 4 (1986/1987): 61 and 65. But while this recipe includes spices, it has no onions or garlic, the flavors that typified Central and Eastern European Jewish cooking. Suet. Suet, the hard fat from around beef kidneys and loins, was not commonly used in European Jewish cooking, where goose fat was most frequently the cooking medium, and suet is not considered to be kosher. It is, however, very commonly used in English puddings. In her recipe for “A baked pudding of ripe fruit or apples” Levy specifies that the pudding must be prepared with chopped suet and “not melted [goose] fat.” Here the author is displaying the strong influence of English cookery on her repertoire. Basin. A pudding basin is a deep round bowl that can be sealed with a lid or plate that allows the pudding to cook in a hot water bath, or, in this case, a pot of tsholnt. Traditionally, a kugl cooked in a tsholnt would be a savory starchy pudding wrapped in a cloth so that it would soak up the flavors of the stew as it cooked. Levy has Anglicized the traditional recipe by using English hardware (the pudding basin) instead of a pudding-cloth and flavoring the pudding with sugar and dried fruit, making a dish that is Jewish in form and English in content. A day and a night. This dish would traditionally be cooked over the Sabbath, beginning on Friday afternoon, so that a hot meal would be ready Saturday, when cooking was not permitted. The author is assuming that the users of this recipe will understand that this is a Sabbath dish. Sauce. This recipe does not recommend a specific sauce but a very similar recipe, “A Rich (Pureem) Pudding—(Feast of Esther)” calls for a sauce made with beaten eggs emulsified with wine and lemon. Kirshenblatt-Gimblett, Barbara. "The Kosher Gourmet in the Nineteenth-Century Kitchen: Three Jewish Cookbooks in Historical Perspective." The Journal of Gastronomy 2, no. 4 (1986/1987): 51-89. Levy, Esther. 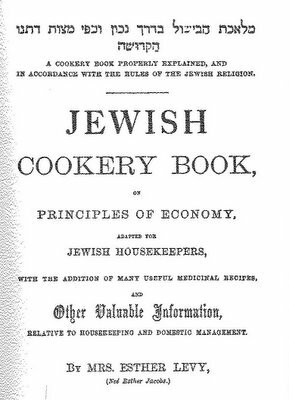 Jewish Cookery Book, on Principles of Economy, Adapted for Jewish Housekeepers, with the Addition of Many Useful Medicinal Recipes, and Other Valuable Information, Relative to Housekeeping and Domestic Management. Philadelphia,: W. S. Turner, 1871. Montefiore, Judith Cohen, and Chaim Raphael. The Jewish Manual, or, Practical Information in Jewish & Modern Cookery: With a Collection of Valuable Recipes & Hints Relating to the Toilette. New York: NightinGale Books, 1983. Oh do I love these historical entries, chocolate lady. Please keep 'em coming. I'm particularly tickled by "cowledge." Not just because the spelling is cute, but because the word itself is interesting, in that it is an eastern European term; in central Europe it would be called באַרכעס. So this attests to the hand of eastern European Jews in the creation of this cookbook, which is interesting. Do you know anything about this Esther Levy? This is a very interesting word and it probably deserves its own entry. I have seen "barkhes," "datshes," and "datsher" in Western Yiddish. I do love the material--more is in the pipe. I suspect that "cowledge" is "koilitsch" which is related to the Hungarian "kolacs" which is a sweet tasting bread. Finger Citron or "Buddha's Hand"